In my previous blog post I explained how I recognized it is difficult for a lot of organisations to support informal and social learning in their organisations, because they are unable to jump the two mindset hurdles of (a) thinking that learning only happens in training courses, and (b) that all organisational learning needs to be controlled by Training/L&D departments. Although there is undoubtedly still a need for organized structured learning initiatives in an organisation, it also becoming clear that an increasing number of organisations do realize that the traditional “course” model has become an outdated way of learning for many people, and that they now need to offer more creative and appealing learning opportunities – with similar features, if you like, to those that informal, social learners have now become used to. 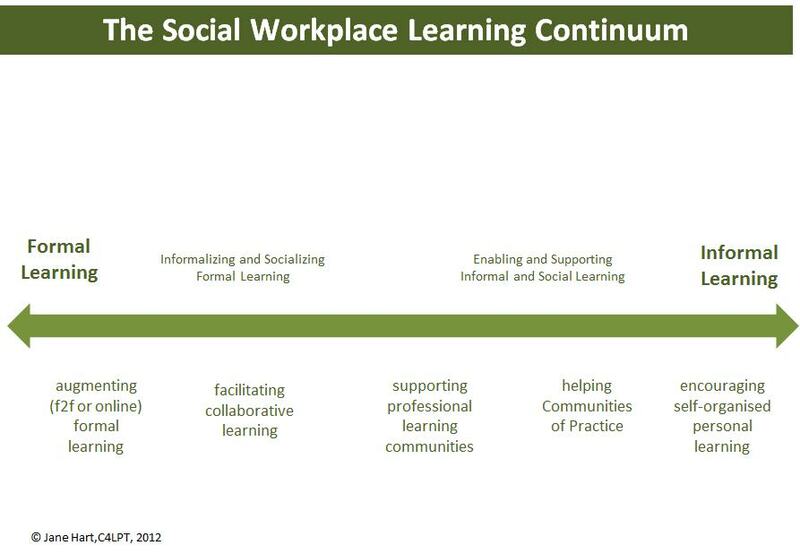 So one approach that I have been promoting is, instead of thinking of Formal and Informal Leaning as polar opposites, rather to think in terms of a Social Workplace Learning Continuum (as shown diagrammatically in the image on the right). But in order to support the full SWL Continuum, there are 5 points to take on board. Just like education has realized that existing school buildings prevent teachers from thinking “out of the classroom box”, and that to stimulate new approaches to learning, they need to build new “creative learning spaces”, the same goes for organizational learning. We need to remember, that (social) learning doesn’t just take place in a training room, but anywhere where people congregate. Although, modern office spaces do provide open meeting areas which support informal gatherings, remember too that we also learn with others virtually – even when we are sitting on our own – so we also need to provide similar virtual informal (learning) spaces. Just as training rooms constrain our thinking about where and how “learning” happens, it’s also time to recognize that current, “learning technologies” (even those that have become more “social”) are purposely designed to reinforce the course/training model – and therefore are not appropriate to support the different types and ways people learn along the continuum. And that in fact, we should we be employing the very same (social) tools or platforms that are used by individuals and teams in their daily workflow to do their jobs. This might be an enterprise social collaboration platform (if one exists) or else other social tools – or even a bit of both. But, by doing this, it will ensure “learning” becomes much more embedded in the workflow than it has ever done before. Key features of such social tools and platforms are things like user profiling, activity streams for real-time updates and commenting, notifications, and the facility to build dedicated group spaces – which can be used for collaborative working and/or learning. It’s also time to start using different terms to refer to the “learning-focused” work that L&D does in the organisation. The term “course” is clearly inappropriate to describe an initiative that involves supporting informal learning, e.g. helping teams to establish Communities of Practice for knowledge sharing and continuous learning and performance improvement. The word “activities” is better since it can be used to describe both the ORGANISATION of structured/formal learning and the SUPPORT of unstructured/informal learning. Some examples of the different types of activities that might be undertaken along the Continuum are shown in the image above. But when considering the organization of structured learning activities, once unshackled from the traditional mindset and from learning technologies that restrict the design process, there is now the opportunity to become more creative and develop more appealing, more modern (learning) activities that are more like the way people chose to learn for themselves. But once again, this means we need to think differently about that whole design process. It is very clear that many individuals find over-engineered (e-)learning solutions frustrating and annoying, so now’s the time to move away from the stylized content we have been producing up to now and instead focus on encouraging participants to “do” things – both practically or reflectively, individually or with others – and on the social interaction between the participants – i.e. sharing their thoughts and experiences on the topic with one another. In other words the emphasis should be on (a) organizing performance-driven and -evaluated activities (not ones based around learning outcomes and measured by activity, tests or completions), (b) promoting social interaction, (c) developing simple/simplified (supporting) content, and (d) providing as much (learner) autonomy and choice as possible. Although the primary modus operandi of L&D is to respond to learning or performance problems, there is also now a big opportunity to support organizational learning in a more continuous way, by offering/supporting a continual flow of organised [learning] activities of various lengths and types. By doing so the L&D department will then have a more visible and significant impact on the business than hitherto – and this is essential in a time when everyone needs to prove their value to their business.